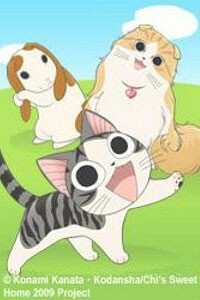 This cat anime is purrfect! It's too bad shows like this aren't in America for kids to watch growing up. Or any country for that matter. It's so cute and Chi, the star of the show, acts just like a cat! Chi says things a cat probably says or thinks. The opening song is sung by Japanese voice actress of Satoshi/Ash Ketchum. I can't get enough of that song! All 104 episodes are totally worth watching. It's a shame there are only about 3 minutes long each! Chi's New Address is the second volume following Chi's Sweet Home where Chi continues her daily adventures, makes new friends and revisits old ones. This is a great "feel good" anime for all ages. Chi is the perfect representation of a strong willed kitten who still has a lot to learn. Chi's New Address is so cute and memorable you will find yourself watching episodes over and over again. It's really fun and incredibly cute, and I didn't get sick of how cute it was because the episodes are only three minutes long. It's something to watch when you need to relax or be cheered up. I love Chi's little kitty voice. I guess "cute" doesn't sound great to everybody but I love this show. Sad there's no more left! Chi was one of the first anime characters I grew to love. I'm so happy that I was able to find and watch this! The anime is easy to catch onto at any point in time in the series. There's a little bit of story to follow, but for the most part it's a lot of comical nonsense that's quite enjoyable. The thought processes of a cat - a kitten, actually - going through daily life is incredibly hilarious. A perspective I didn't much consider until this anime. The episodes are more like shorts rather than episodes - very small segments of story at a time. It's easy to pick up at any time and enjoyable on a bad day. Would love to see even more of this kind of light-hearted anime that the kids and I can enjoy together. BTW, if you really enjoy it, there are full color manga available at major US booksellers. Chi's sweet home is a nice little anime that is just doing it's job...being a kids show. It's adorable and I like the simple art style this has and I also like that it's short so if you don't have enough time on your hands you can at least sit down for 1 or 2 episodes. Cutest cat ever and fun to watch! Originally a manga in a men's magazine, but feels like it was written for kids; basically it doesn't matter your age--if you like cute cats you will enjoy Chi! Short episodes with some occasional longer-running plots. If you like Chi you might like the anime PoyoPoyo too.